In 1122, Henry V, Holy Roman Emperor entered into an agreement with Pope Calistus II known as the Concordat of Worms. The Concordat of Worms (Latin: Concordatum Wormatiense), sometimes called the Pactum Calixtinum by papal historians,[lower-alpha 1] was an agreement between Pope Calixtus II and Holy Roman Emperor Henry V on September 23, 1122, near the city of Worms. It brought to an end the first phase of the power struggle between the Papacy and the Holy Roman Emperors and has been interpreted[lower-alpha 2] as containing within itself the germ of nation-based sovereignty that would one day be confirmed in the Treaty of Westphalia (1648); in part this was an unforeseen result of strategic maneuvering between the Church and the European sovereigns over political control within their domains. The King was recognised as having the right to invest bishops with secular authority ("by the lance") in the territories they governed, but not with sacred authority ("by ring and staff"); the result was that bishops owed allegiance in worldly matters both to the pope and to the king, for they were obliged to affirm the right of the sovereign to call upon them for military support, under his oath of fealty. Previous Holy Roman Emperors had thought it their right, granted by God, to name Church officials within their territories (such as bishops) and to confirm the Papal election (and, at times of extraordinary urgency, actually name popes). In fact, the Emperors had been heavily relying on bishops for their secular administration, as they were not hereditary or quasi-hereditary nobility with family interests, thus adding further suspense to the struggle. A more immediate result of the Investiture struggle identified a proprietary right that adhered to sovereign territory, recognising the right of kings to income from the territory of a vacant diocese and a basis for justifiable taxation. These rights lay outside feudalism, which defined authority in a hierarchy of personal relations, with only a loose relation to territory. The pope emerged as a figure above and out of the direct control of the Holy Roman Emperor. Following efforts by Lamberto Scannabecchi (later Pope Honorius II) and the Diet of Würzburg (1121) in 1122, Pope Calistus II and Holy Roman Emperor Henry V entered into an agreement that effectively ended the Investiture Controversy. By the terms of the agreement, the election of bishops and abbots in Germany was to take place in the emperor's presence as judge between potentially disputing parties, free of bribes, thus retaining to the emperor a crucial role in choosing these great territorial magnates of the Empire. Beyond the borders of Germany, in Burgundy and Italy, the Emperor was to forward the symbols of authority within six months. Calixtus' reference to the feudal homage due the emperor on appointment is guarded: "shall do unto thee for these what he rightfully should" was the wording of the privilegium granted by Calixtus. The Emperor's right to a substantial imbursement on the election of a bishop or abbot was specifically denied. The most prized and contested rights that attached to benefices were inheritance and security against confiscation. Benefices were lands granted by the Church to faithful lords. In exchange, the Church expected rent or other services, such as military protection. These lands would then be further divided between lesser lords and commoners. This was the nature of European feudalism. Inheritance was an important issue, since land could fall into the hands of those who did not have loyalty to the Church or the great lords. The usual grant was in precaria, the granting of a life tenure, whereby the tenant stayed on the land only at the pleasure of the lord. The tenant could be expelled from the land at any time. His tenancy was precarious. Counts’ benefices came to be inherited as counties were broken up and as counts assimilated their offices and ex-officio lands to their family property. 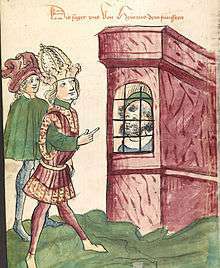 In central Europe, kings and counts probably were willing to allow the inheritance of small parcels of land to the heirs of those who had offered military or other services in exchange for tenancy. This was contingent on the heirs being reasonably loyal and capable. Churches in Germany, as elsewhere, were willing to allow peasants to inherit their land. This was a source of profit to both churches and lords when the inheritors were charged a fee to inherit the land. Most bishops had a different attitude toward freemen and nobles. To these peasants, grants were made in precario or in beneficio, usually for a specified and limited number of life tenures. It was not impossible to recover land left to noble families for generations. But the longer the family held church land, the more difficult it was to oust them from the land. Some church officials came to view granting land to noble families amounted to outright alienation. By the twelfth century great churches in Germany, like those elsewhere were finding it difficult to hold out against the accumulation of lay custom and lay objections to temporary inheritance. The Bishop of Worms issued a statement in 1120 indicating the poor and unfree should be allowed to inherit tenancy without payment of fees. It appears to have been something novel. The growing masses of unfree and the marginal were needed for labour, and to bolster the military of both nobility and the church. By the time of Henry IV, bargaining by the peasants for the benefit of the group was the norm. Pope Gregory VII began reforms that led to the Concordat of Worms. The Holy Roman Emperors of Ottonian Dynasty, when they came to the throne, believed they should have the power to appoint the pope. They also believed they should appoint minor church officials. The result was that, more often than not, bishops, abbots of monasteries, and even the pope were not independent, but resembled lackeys or sycophants of the crown of the Holy Roman Empire. This attitude was bolstered by the general conception that the Holy Roman Emperor and all other European Kings were chosen by God to be leaders. For temporal secular reasons, the kings did nothing to dispel this attitude. It meant more power for them. A series of popes began to directly challenge this condition. The most vocal and strident was Pope Gregory VII. Reform took a century, but brought greater autonomy for the papacy and the Church in general. In the period immediately after 1000, two figures appeared to lead Western Christendom, the pope and the Holy Roman Emperor. Antagonism between the two dominated the next century. After the death of Pope Silvester II in 1003, the papacy fell under the influence of the nobility in Latium, and then after 1046, under the influence of the German emperors. The reality for the west in the Middle Ages was not only the fact that government was split up into small particles but also the fact that vertical and horizontal powers were entangled. People in the Middle Ages did not always know to which of the many lords, the Church and the individual churches, the towns, princes, and kings, they were subordinate. This can be observed in the complexity even at the administrative and judicial level in the jurisdictional conflicts that fill mediaeval history. The Church endeavoured to become disengaged from the German control. An example of this secular politicisation is seen when Conrad II, Holy Roman Emperor supported Pope Benedict IX, the most corrupt of any of the popes of the era. It took more than a century to end this manipulation, and was never complete. In the process, the whole Church emerged freed from the grip of all lay lords. This was known as the Gregorian Reform, which takes its name from Pope Gregory VII, (1073–85) . It was merely the latest and most visible of reforms that tended to move the Church back to its roots. It was a question of restoring the autonomy and power of the priestly class in the face of increasing control by the warrior class. The clergy was forced to renew and define itself. There was a battle against simony. The roadmap to celibacy was drawn, if not immediately enacted. Monarchs were excluded from selecting popes. This had been decreed by Pope Nicholas II in 1059. Afterwards, only cardinals could elect the pope. Gregorian Reform reiterated this notion. There was to be no more lay interference in the selection of clergy. The aim was to deprive emperors and their under-lords the right to nominate and invest bishops. The effect was to deprive lay kings power over the Church and increase both spiritual and temporal power in the Vatican and the bishops. Gregory VII appeared to have succeeded when the emperor Henry IV, Holy Roman Emperor was humiliated at Canossa in 1077. There, Henry begged in the snow to be let back into the good graces of the Church, having been excommunicated the year before by Gregory. The penitent and humbled emperor did not remain in that state. Soon Henry IV took his revenge. He named his own pope Antipope Clement III in the old manner of the Holy Roman Emperors. Pope Urban II, more prudent than Gregory sidestepped the issue using a Crusade to gather Christian Europe together under his authority. A compromise was reached in Worms in 1122, by which the emperor abandoned investiture “by ring and staff” to the pope, and promised to respect the freedom of elections and consecrations, but kept for himself the right to invest bishops with the temporalities of their sees “by scepter”. Though the Emperor retained some power over imperial churches, his power was damaged irreparably because he lost the religious authority that previously belonged to the office of the king. 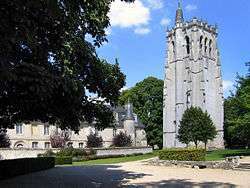 In France, England, and the Christian state in Spain, the king could overcome rebellions of his magnates and establish the power of his royal demesne because he could rely on the Church, which, for several centuries, had given him a mystical authority. From time to time, rebellious and recalcitrant monarchs might run afoul of the Church. These could be excommunicated, and after an appropriate time and public penance, be received back into the communion and good graces of the Church. Henry IV begging forgiveness of Pope Gregory VII at Canossa, the castle of the Countess Matilda, 1077. 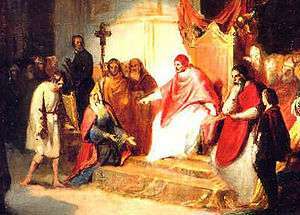 In 1075, Gregory VII condemned lay investiture in a document called Dictatus papae. The new doctrine was called libertas ecclesiae ("freedom of the Church"). Henry IV insisted on involvement in clerical appointment. The dispute revolved around the issue of investiture—i.e., whether the Holy Roman Emperor had the right to name bishops as well as popes. Gregory VII excommunicated Henry IV in 1076, releasing all Henry's subjects from obedience to him. It led to a great political struggle with many barons rising against Henry in open rebellion. Henry made his way to the Canossa where the Pope was staying in the castle of Countess Matilda. Henry claimed a wish to repent. The pope was suspicious of Henry’s motives, and did not believe he was truly repentant. Henry did penance in the snow outside the castle for three days. Finally, Gregory gave him absolution. The rebellious nobles in Germany who were interested in deposing Henry IV never forgave Pope Gregory VII for what they viewed as treachery. Henry IV was excommunicated again in 1080, and would not show any indication of repentance. In turn, Henry called a council of bishops who proclaimed Gregory illegitimate. He remained excommunicate for twenty-six years until his death in 1106. It was the consequence of this lengthy episode that a whole generation grew up in Germany and Northern Italy in an atmosphere of war, doubt and scepticism. The papal backers had been busy propounding arguments to show that royal power was not of divine origin. They had been so successful that the moral authority of the Emperor had been undermined in the minds of many of his subjects. Serious divisions existed from this battle over the Investiture controversy, which fractured large portions of the Holy Roman Empire in Germany and Italy. Davis argues these rifts were so deep and lasting that neither Germany nor Italy were able to form a cohesive nation state until the 19th century. A similar situation arose from the French revolution, which caused fractures in France that still exist. The effect of Henry’s excommunication, and his subsequent refusal to repent left a turbulence in central Europe that lasted throughout the Middle Ages. It may have been emblematic of certain German attitudes toward religion in general, and the perceived relevance of the German Emperor in the universal scheme of things. Henry IV became so filled with hubris over his position, that he renounced Gregory VII and named the bishop of Ravenna pope. Perhaps he was only following what had been thought to be the right of kings: to name the pope. Henry had invested the Ravenna bishop, and now he referred to the new pope, Clement III, Antipope Clement III as "our pope". Henry attacked Rome, and on the outskirts of the city gained thirteen cardinals who became loyal to his cause. On Palm Sunday, 1084, Henry IV solemnly enthroned Clement at St. Peter's Basilica and on Easter Day, Clement returned the favour and crowned Henry IV as Emperor of the Holy Roman Empire. Gregory VII was meanwhile still resisting a few hundred yards away from the basilica in the Castel San Angelo, then known as the house of Cencius. Gregory appealed to the Normans for help, and Robert Guiscard responded, entering Rome on May 27, 1084 and rescuing him. 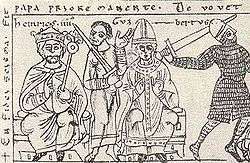 Contemporary illustration of Henry IV (left) and Anti-pope Clement III (centre). In the process, Rome was pillaged and partially burned. Gregory VII died the next year on May 25, 1085 in exile. He felt all was lost. The last words he uttered were, "I have loved justice and hated iniquity, and therefore I die in exile." Gregory VII must have felt he died in utter failure, and to many of his contemporaries it appeared Henry IV and Antipope Clement III had won. But the underlying current was that Henry had overreached, and his appointment of the antipope was beyond the pale. Upon the death of Gregory, the cardinals elected a new pope, Victor III. He owed his elevation to the influence of the Normans. Antipope Clement III still occupied St. Peter’s. When Victor III died, the cardinals elected Urban II (1088–99). He was one of three men Gregory VII suggested as his successor. Urban II preached the First Crusade, which united Western Europe, and more importantly, reconciled the majority of bishops who had abandoned Gregory VII. In the end, Gregorian Reform won out over Henry IV. Preaching the Crusade had one important consequence. The pope was now viewed as the head of the Church. No longer would kings and emperors think themselves equals of the pope, or the head of the Church in their kingdom. This was the situation from 1122 until the Reformation. Several years later, Henry IV died in a deep gloom as had Gregory. It remained for his successor, Henry V to agree with Pope Calixtus II in 1122 to a compromise of the conflict over lay investitures known as the Concordat of Worms. The reign of Henry IV showed the weakness of the German monarchy. The ruler was dependent upon the good will of the great men, the nobility of his land. These were technically royal officials and hereditary princes. He was also dependent on the resources of the churches. Henry IV alienated the Church of Rome and many of the magnates in his own kingdom. Many of these spent years in open or subversive rebellion. Henry failed to create a proper bureaucracy to replace his disobedient vassals. The magnates became increasingly independent, and the Church withdrew support. Henry IV spent the last years of his life desperately grasping to keep his throne. It was a greatly diminished kingdom. 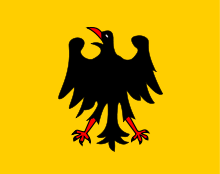 The German Emperors flew this banner prior to 1300. The reign of Henry IV ended with a diminished kingdom and waning power. Many of his underlords had been in constant or desultory revolt for years. Henry IV’s insistence that Antipope Clement III was the real pope had initially been popular with some of the nobles, and even many of the bishops of Germany. But as years passed, this support was slowly withdrawn. The idea that the German king could and should name the pope was increasingly discredited and viewed as an anachronism from a by-gone era. The Empire of the Ottos was virtually lost because of Henry IV. Henry IV's son, Henry V, rebelled and became emperor after his father's abdication. Henry V realised swift action and a change in his father's policy was necessary. Pope Paschal II rebuked Henry V for appointing bishops in Germany. The king crossed the Alps with an army in 1111. The pope, who was weak and had few supporters was forced to suggest a compromise, the abortive Concordat of 1111. Its simple and radical solution of the Investiture Controversy between the prerogatives of regnum and sacredoium proposed that German churchmen would surrender their lands and secular offices to the emperor and constitute a purely spiritual church. Henry gained greater control over the lands of his kingdom, especially those that had been in the hands of the church, but of contested title. He would not interfere with ecclesiastical affairs and churchmen would avoid secular services. The church would be given autonomy and to Henry V would be restored large parts of his empire that his father had lost. Henry V was crowned by Pope Paschal II as the legitimate Holy Roman Emperor. When the concessions of land were read in St. Peters, the crowd revolted in anger. Henry took the pope and cardinals hostage until the pope granted Henry V the right of investiture. Then he returned to Germany – crowned emperor and apparent victor over the papacy. The victory was as short-lived as that of his father, Henry IV over Gregory VII. The clergy urged Paschal to rescind his agreement, which he did in 1112. The quarrel followed the predictable course: Henry V rebelled and was excommunicated. Riots broke out in Germany, a new Antipope Gregory VIII was appointed by the German king, nobles loyal to Rome seceded from Henry. The civil war continued, just as under Henry IV. It dragged on for another ten years. Like his father before him, Henry V was faced with waning power. He had no choice but to give up investiture and the old right of naming the pope. The Concordat of Worms was the result. After the Concordat, the German kings never had the same control over the Church as had existed in the time of the Ottonian Dynasty. Henry V died without heirs in 1125, three years after the Concordat. He had designated his nephew, Frederick von Staufen duke of Swabia, also known as Frederick II, Duke of Swabia as his successor. Instead, churchmen elected Lothar III. 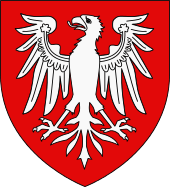 A long civil war erupted between the Staufen also known as Hohenstaufen supporters and the heirs of Lothar III. The result was the Hohenstaufen Frederick I (Barbarossa) 1152–1190 who came to power. The agreement reached at Bec Abbey in 1107 was essentially the same as the Concordat of Worms. The Concordat of Worms was foreshadowed the Charter of Liberties of Henry I of England. He was the youngest son of William the Conqueror. Through a series of political intrigues, Henry I gained the English throne in 1100. Henry had three problems: (1) Conflict with the Church and Anselm of Canterbury in particular. (2) The earls and barons of England did not accept Henry as their king. (3) The Anglo-Saxon populace did not accept him. Henry reconciled with the Church and Anselm. He married Edith, the daughter of the Scots King Malcolm III. The Anglo-Saxon population was placated because they viewed Edith as one of their own. Henry signed and issued the Charter of Liberties in 1100 from the Norman Chapel in the Tower of London. This gave concessions to the earls and barons, as well as the Church. The investiture issue was still contentious, but a compromise at Bec Abbey in 1107 was essentially identical to the Concordat of Worms. The Concordat of London in 1107 was a forerunner of the compromise that was taken up in the Concordat of Worms. In England, as in Germany, the conflict between Church and State was rife. A distinction was being made in the king's chancery between the secular and ecclesiastical powers of the prelates. Bowing to political reality, Henry I of England ceded his right to invest his bishops and abbots and reserved the custom of requiring them to come and do homage. The system of vassalage was not divided among great local lords in England as it was in France, for by right of the Conquest the king was in control. Henry I of England perceived a danger in placing monastic scholars in his chancery and turned increasingly to secular clerks, some of whom held minor positions in the Church. He often rewarded these men with the titles of bishop and abbot. Henry I expanded the system of scutage to reduce the monarchy's dependence on knights supplied from church lands. Unlike the situation in Germany, Henry I of England used the investiture controversy to strengthen the secular power of the king. It would continue to boil under the surface. The controversy would surface in the Thomas Becket affair under Henry II of England, the Great Charter of 1217, the Statutes of Mortmain and the battles over Cestui que use of Henry VII of England, and finally come to a head under Henry VIII of England. 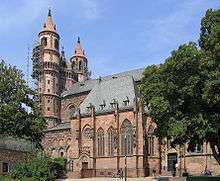 The Cathedral of Worms was 10 years old when the Concordat was issued there in 1122. Of the three reforms Gregory VII and his predecessors and successor popes had attempted, they had been most successful in regard to celibacy of the clergy. Simony had been partially checked. Against lay investiture they won only a limited success, and one that seemed less impressive as the years passed. During the time following the Concordat of Worms, the Church gained in both stature and power. According to the terms of the compromise, the election of bishops and abbots was to follow proper procedure, that is, the canons of the cathedral were to elect the bishop. The monks were to choose the abbot, and only ecclesiastical superiors were to invest the candidate with ring and staff (the traditional insignia of the episcopal office). This was a minimum that the church had demanded (who had far fewer problems with a mere nomination by a layman if the layman did not actually hand over ring and staff). To make up for this and symbolise the worldly authority of the bishop which the pope had always recognised to derive from the Emperor, another symbol, the scepter, was invented, which would be handed over by the king (or his legate). The rest is an actual compromise: In Germany, the Emperor (or his legate) would have the right to be present at elections to resolve any disputes between candidates ("yet without violence"). What this meant, in effect, was that the king would have the bishop he wanted (though over time, the territorial princes would get some "representation" within the chapters, making it less easy to ignore them). The bishop-elect would then by invested by the Emperor (or representative) with the scepter and, sometime afterwards, by his ecclesial superior with ring and staff. As William of Champeaux assured Henry V, he had nothing to lose by surrendering the right of investiture. The king retained substantially what he already possessed—the power to fill bishoprics with men of his choice. Nevertheless, Gregory VII’s dramatisation of the issue produced a significant improvement in the character of men raised to the episcopacy. Kings no longer interfered so frequently in their election, and when they did, they generally nominated more worthy candidates for the office. This takes only Germany into account, though. As for Burgundy and Italy, elections were to be held without interference by the Emperor, and consecration and investiture by the ecclesial superior would, here, precede the investiture with the scepter which was to follow some time afterwards. Thus, by the Pope accepting the German bishops to be nominated with a large amount of secular influence, his right was recognized to freely choose the bishops in the other parts of the Empire, especially in Imperial Italy at the very doors of the Papal States. To see in the Concordat of Worms mere face-saving of the Church is thus not correct. The writing in the document was ambiguous, skirted some issues and avoided others all together. This has caused some scholars to conclude that the settlement turned its back on Gregory VII and Urban II's genuine hopes for reform. The emperor's influence in episcopal was preserved, and he could decide disputed elections. If the compromise was a rebuke to the most radical vision of the liberty of the Church, on at least one point its implication was firm and unmistakable: The king, even an emperor, was a layman, and his power at least morally limited (hence, totalitarianism was unacceptable). According to the opinion of W. Jordan, the divine right of kings was dealt a blow from which it never completely recovered, yet it should be noted that unfettered authority and Caesaropapism was not something the later Mediaevals and Early Moderns understood by the phrase "by the grace of God" (which many of them ardently defended). If anything, a blow was dealt to subconsciously remaining pre-Christian Germanic feelings of "royal hail". 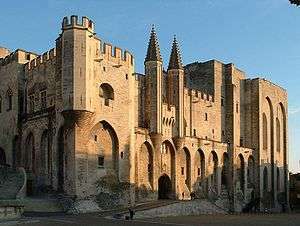 The Avignon Papacy occurring several centuries after the Concordat, and indicated that there was continued interference in the papacy by kings. There exists a misconception concerning the power of the pope in the Middle Ages. Tradition affords him more power and authority than he actually possessed. It is likely the pope in modern ages is much more powerful than those in mediaeval times. The most powerful of all mediaeval popes was Innocent III. His pronouncements on doctrinal matters and the judgments of his court were considered definitive and final. Opposing the mediaeval pope was the primary and unyielding authority of the state. The struggle over investiture between Pope Gregory VII and Henry IV, Holy Roman Emperor had dramatised the clash between church and state. The Concordat of Worms had eased the situation for a generation. But in the end, it solved nothing. Practically speaking, the king retained a decisive voice in the selection of the hierarchy. All kings supported King John of England’s defiance of Pope Innocent III ninety years after the Concordat of Worms in the matter concerning Stephen Langton. In theory, the pope named his bishops and cardinals. In reality, more often than not, Rome consecrated the clergy once it was notified by the kings who the incumbent would be. Recalcitrance by Rome would lead to problems in the kingdom. For the most part it was a no-win situation for Rome. In this, the Concordat of Worms changed little. The growth of canon law in the Ecclesiastical Courts was based on the underlying Roman law and increased the strength of the Roman Pontiff. The English Church was left more or less in the power of the English monarchy. This was the result of the Charter of Liberties, 1100, and the agreement at Bec in 1107. The effect of the Concordat of Worms was different. It ended a civil war that had been going on for more than fifty years. There was no going back to the situation that had preceded it. The political and social structure of Germany had forever been altered. The new generation of cardinals regarded German investiture with contempt and as an embarrassing vestige of the past. They were willing to make concessions with Henry V and his successors in order to get along. The belief after the Concordat was that investiture and the era of theocratic kingship was a discredited doctrine. The German kings had a different view of the matter. Henry V and his successors still believed they had the right and ability to name bishops. In practice, this was true, but only in the territories held by their families. Their domain in the religious sphere had been greatly diminished. The catastrophic political consequences of the struggle between pope and emperor also led to a cultural disaster. Germany lost intellectual leadership in western Europe. In 1050, German monasteries were great centres of learning and art and German schools of theology and canon law were unsurpassed and probably unmatched anywhere in Europe. The long civil war over investiture sapped the energy of both German churchmen and intellectuals. They fell behind advances in philosophy, law, literature and art taking place in France and Italy. In many ways, Germany never caught up during the rest of the Middle Ages. Universities were established in France, Italy and England by the early 13th century. Notable are University of Bologna, 1088, University of Paris, 1150, Oxford University, 1167 and Cambridge University, 1207. The first German university, the University of Heidelberg was not established until 1386. It was immediately steeped in mediaeval nominalism and early Protestantism. Kings continued to attempt to control either the direct leadership of the church, or indirectly through political means for centuries. This is seen most clearly in the Avignon Papacy when the popes moved from Rome to Avignon. The conflict in Germany and northern Italy arguably left the culture ripe for various Protestant sects, such as the Cathars, the Waldensians and ultimately Hus and Luther. Pope Calixtus was of the House of Burgundy. Henry IV and Henry V were of the House of Franconia. I, bishop Calixtus, servant of the servants of God, do grant to thee beloved son, Henry-by the grace of God august emperor of the Romans-that the elections of the bishops and abbots of the German kingdom, who belong to the kingdom, shall take place in thy presence, without simony and without any violence; so that if any discord shall arise between the parties concerned, thou, by the counsel or judgment of the metropolitan and the co-provincials, may'st give consent and aid to the party which has the more right. The one elected, moreover, without any exaction may receive the regalia from thee through the lance, and shall do unto thee for these what he rightfully should. But he who is consecrated in the other parts of the empire (i.e. 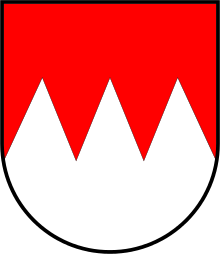 Burgundy and Italy) shall, within six months, and without any exaction, receive the regalia from thee through the lance, and shall do unto thee for these what he rightfully should. Excepting all things which are known to belong to the Roman church. Concerning matters, however, in which thou dost make complaint to me, and dost demand aid, I, according to the duty of my office, will furnish aid to thee. I give unto thee true peace, and to all who are or have been on thy side in the time of this discord. In the name of the holy and indivisible Trinity, I, Henry, by the grace of God august emperor of the Romans, for the love of God and of the holy Roman church and of our master pope Calixtus, and for the healing of my soul, do remit to God, and to the holy apostles of God, Peter and Paul, and to the holy catholic church, all investiture through ring and staff; and do grant that in all the churches that are in my kingdom or empire there may be canonical election and free consecration. All the possessions and regalia of St. Peter which, from the beginning of this discord unto this day, whether in the time of my father or also in mine, have been abstracted, and which I hold: I restore to that same holy Roman church. As to those things, moreover, which I do not hold, I will faithfully aid in their restoration. As to the possessions also of all other churches and princes, and of all other lay and clerical persons which have been lost in that war: according to the counsel of the princes, or according to justice, I will restore the things that I hold; and of those things which I do not hold I will faithfully aid in the restoration. And I grant true peace to our master pope Calixtus, and to the holy Roman church, and to all those who are or have been on its side. And in matters where the holy Roman church shall demand aid I will grant it; and in matters concerning which it shall make complaint to me I will duly grant to it justice. ↑ In his article "The Pactum Callixtinum: An Innovation in Papal Diplomacy", P. W. Browne observes that the term concordat was not in use until Nicolas of Cusa's De concordantia catholica. ↑ De Mesquita's thesis is that "the development of important institutions of the modern sovereign state are partially an endogenous product of strategic manoeuvring between the Catholic Church and European kings over political control within their domains". ↑ "Simple and radical": Norman F. Cantor, 1993. The Civilization of the Middle Ages p.262. 1 2 Halsall, Paul, ed. (Jan 1996). "The Concordat of Worms 1122". Internet History Sourcebooks Project. New York: Fordham University Center for Medieval Studies. OCLC 82800626. Archived from the original on 1998-12-03. Retrieved 2014-03-28. 1 2 This article incorporates text from a work in the public domain: Henderson, Ernest F., ed. (1910). Select historical documents of the Middle Ages. London: George Bell and Sons. pp. 408–409. OCLC 807119679. Browne, P. W. (1922). "The Pactum Callixtinum: an innovation in Papal diplomacy". The Catholic Historical Review. 8 (2): 180–190. JSTOR 25011853. Cantor, Norman F. (1969). Medieval History, The Life and Death of a Civilization. Macmilllan. Dahmus, Joseph (1969). The Middle Ages, A Popular History. Garden City, NY: Doubleday and Company. Davis, R. H. C. (1966). A History of Medieval Europe, From Constantine to Saint Louis. Longmans. Fawtier, Robert (1964). The Capetian Kings of France. London. Joranson, Einar (1948). "The inception of the career of the Normans in Italy - legend and history". Speculum. 23 (3): 353–396. doi:10.2307/2848427. JSTOR 2848427. Jordan, William Chester (2003). Europe in the High Middle Ages. Penguin History of Europe. Viking. Le Goff, Jacques (1964). Medieval Civilization 400–1500. de Mesquita, Bruce Bueno (2000). "Popes, kings, and endogenous institutions: the Concordat of Worms and the origins of sovereignty". International Studies Review. 2 (2: Continuity and Change in the Westphalian Order): 93–118. JSTOR 3186429. Reynolds, Susan (1994). Fiefs and Vassals, The Medieval Evidence Reinterpreted. Oxford University Press. Strayer, Joseph R. (1959). The Middle Ages, 395–1500 (4th ed.). Appleton-Century-Crofts. Stroll, Mary (2004). Calixtus II (1119–1124): A Pope Born to Rule. Brill. Thorndike, Lynn (1956). The History of Medieval Europe (3rd ed.). Houghton Mifflin. Bettenson, Henry, and Chris Maunder, eds. (2011). Documents of the Christian Church. Oxford University Press. Slocum, Kenneth, ed. (2010). Sources in Medieval Culture and History. pp. 170–75.